The power grid is one of those things that most of us take for granted, but it's time to acknowledge that it's getting older, reaching capacity and under attack. In the article “Bracing for a big power grid attack: ‘One is too many'“, USA Today states “About once every four days, part of the nation's power grid — a system whose failure could leave millions in the dark — is struck by a cyber or physical attack.” Without a preparedness blueprint in place, most of us would be in bad shape with an extended grid outage. 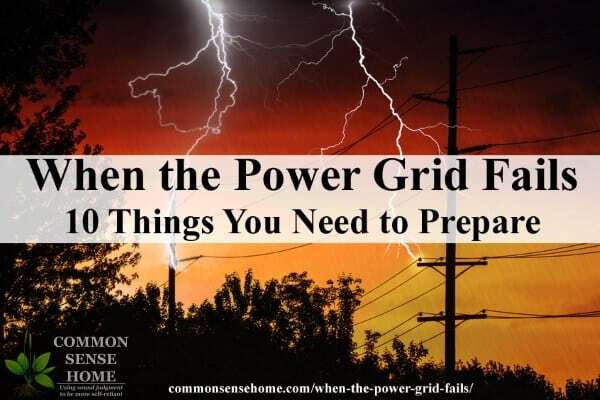 In this post, we'll discuss why the power grid goes down, and how to prepare for a power outage that disrupts electricity and basic services such as communications, water and trash pickup. My husband the ex-Boy Scout, August, pulled this list together to help you be more prepared. If the power fails, water and natural gas will fail soon thereafter so planning is critical. Make sure you can see! Even a small flashlight can make a huge difference. Consider a flashlight for your car, each bedroom, each bathroom and in your kitchen, garage, and one near your electrical panel and a couple spares (especially if you have kids who lose them). The power can go out when you don’t expect it – anywhere. Consider one for your key ring, your pocket and/or purse, and one at work. Think – Could you find your way out in pitch black with elevators not working at home or work or when traveling? Candles or hurricane lamps are possible lighting source, but keep in mind they create a fire risk and fresh air may be a problem if you are in a tightly sealed building. One advantage of candles and lamps is that they do provide heat, which is useful for cold climates. A crank powered flashlight is great for kids and serve a double function as a flashlight and backup charger for emergencies. Plus you can get them relatively inexpensively. Best inexpensive flashlight – pack of AAA Kootek XPE-Q5 LED flashlight with adjustable focus zoom for more info on this flashlight see the “Best Cheap Flashlight” post. Good small work flood light (has a magnet so it can stick to car while changing a tire) the AAA NEBO COB flashlight is a great option. See also The Best Cheap Flashlight post. Flashlights are great, but when is the last time you checked them? Do you have long life batteries? Where is your stash of 10yr or 20yr AA batteries? Standardize your flashlights and other battery gear on AA or AAA if possible. Get batteries, a lot of them. You can get 10yr to 20yr life AA batteries. Consider rechargeable batteries and a good charger. They cost a bit more up front but can save you a lot over the years. There are crank and solar battery chargers, plus your car can charge batteries while you travel using a 12 volt adapter. While we normally use refillable water bottles, we do keep cases of water bottles around for emergencies. Rotate your water storage. Even water will go stale after extended storage. We have a 55 gal drinking potable water drum with a pump and roller base for emergencies. If you suspect power might go out, fill your bathtub, your sink, keep your toilets flushed BEFORE the power goes out. When the power is out, follow the rhyme “if its yellow let it mellow, if its brown flush it down”. You will likely be using a VERY limited amount of water to flush. A bucket of so-so water might not be that great to drink, but it can still flush the toilet. Dish water should be used in a bucket or plugged sink. That dirty water is just fine for flushing toilets. (Don't forget to stock up on extra toilet paper.) Finally, consider good water filters such as Berkey and/or Lifestraw. These can take questionable water and make it drinkable. See Emergency Water Storage and Filtration – What You Need to Know for a more detailed list of water storage and filtration options. If you can’t have a generator, can’t afford one, or don’t know how to deal with one, you can still be further prepared. Know where your power panel is and what each breaker services in your home and practice going to check the panel at least once a year with your entire family. If you can afford it consider a generator. See Emergency Power Options for Your Home for more information on providing your own power. Refrigerators & Freezers – If the power does go out, dramatically limit access to freezers and refrigerators. They will stay cold longer closed. If you have a generator do you have a way to get power from the generator to the freezer? It seems simple but where did you store that extension cord? Maybe consider an extra one set aside for emergencies. If you can grill, have extra charcoal (2 to 10 bags depending on space and family size). Grill meat that would go bad first and plan food consumption that way. A gas stove might have a pilot light but could also require power. Figure that out BEFORE a power outage. A small camp stove can also provide a low fuel quick meal. A rocket stove, or mini gas stove can give a hot meal which can make a big difference. Have you ever cooked on it? Do it once a year, make a party out of it – roast hot dogs and then marshmallows. Cooking over a fire or grill is an option… but do you have mits / tongs / spatulas and metal plates and such to use for the food? This is really small, it can handle one or two portion warm up, if you want more consider the Eco Zoom above. See Emergency Cooking – 10 Ways to Have a Hot Meal When the Power Goes Out for more information on cooking without electricity. You need a lot of garbage bags (consider at least 3 boxes). You might need to poop on a newspaper, or in a DIY Emergency Toilet and store up refuse in a black plastic bags. How many large garbage bins could you set aside for water, or refuse, or cleanup, or garbage? What about critters coming around (rats, possum…) if you have a lot of garbage? Work out a plan for garbage for dealing with disrupted garbage pickup. If you need to burn garbage, build a burn barrel that burns safe and clean. Start by stocking extra of what you regularly eat, focusing on dry goods. If you like a specific type of granola bar, or cereal or soup, keep a few extra of them and keep eating the oldest ones. It doesn’t cost a lot more and your day to day activity keeps the food fresh and you automatically restock. Use a Stackable Can Rack Organizer to rotate your canned goods with a first in first out rotation. Jerky, chocolate and dried fruit keep well and make a good treat after a few days of no power, no internet and no TV. 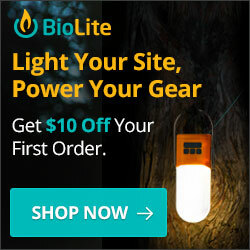 Consider purchasing a 72 hour kit or MRE type foods. They are expensive but a great thing if you don’t have food. Buy small sample sizes and taste test before you buy a bulk supply. If the budget allows, a home freeze dryer may be a worthwhile investment. That way you can store food you know tastes good that your family will eat. The MINIMUM goal is enough food for 72 hours for everyone in the family – including pets. A longer stockpile is better, especially if you can stock a bit more of the food you are eating already, and supplement it with MRE, Freeze dried or other canned food you find palatable. Get Sharpie Permanent Markers to write dates on your cans and dry goods. Mountain House 3 day (72 hour) food kit for 1 adult Mountain House Just in Case 72 Hour Kit – Buy one per adult. **Try buying and eating one meal with the family before you decide. You might like Auguson Farms, Mountain House, MREs, Wise, Legacy (or others). Check out Emergency Heat During a Power Outage and other Winter Storm Preps for cold weather survival tips. For hot areas, read 12 Best Tips for Keeping Your house Cool Without AC. A crank powered radio is good too. Get one that can listen to emergency broadcasts, and even better one that can listen to TV broadcasts. Also consider HAM radio or multi-pack handheld radios. Either make your own first aid kit or buy one. Have one kit for home, one in the car/truck, and one for work. You should have enough to be able to hold yourself over if the police/fire/rescue cant show up for roughly a week, so that means medications, insulin, prescription meds, inhalers, insulin, adrenaline, or whatever you need (or might need) to take care of yourself and your family. Ideally, you should get CPR training and basic 1st aid BEFORE you need it, and get the entire family through it, even the squeamish ones. This list highlights critical items, but there are many more that will improve comfort levels. Businesses that are open may only be able to take cash, or only take credit. It's good to have both on hand, especially small bills. With clean water scarce, extra paper plates and plastic silverware mean less dish washing. Disposable plates means garbage more garbage (#6). Garbage bags can also be makeshift tarps if a window is blown in. But how do you hold the tarp or garbage bag in place? Where is your stash of duct tape? Oh and clothes? Do you have a stash of one or two changes of clothes relative to the season set aside – maybe the power outage occurs right before your weekly laundry day? What about a pair of gloves? An emergency stash of fresh socks and underwear can make a world of difference in comfort. Paper is handy to take notes. A deck of cards or a couple board games can help to pass the time. Do you have a box of matches to light a candle or start a charcoal grill? Do you have hand wipes, alcohol swipes and sanitizing hand wash so you can clean up without using drinking water? Read 20 Things I Wish I Had Before the Flash Flood Emergency to a full list of items you may not have considered for emergency preps. Know how to get in and out of buildings at home, work and frequented buildings if the power is out, and elevators aren’t working. This seems simple but try it at least once, just to make sure you can find your way with the building black and you only having a flashlight. Plan with your neighborhood, with your friends and family. Maybe one person is good at first aid, another is a camper, another is a hunter and so on. A prepared group is much better than a prepared individual. Teams win, build a team. This can lead to other ideas like local walk-talkies; ham radio for talking to the team. Maybe you get bicycles so everyone can join up at the guy with the big house. If its out in the country up north it could be a big gas tank a friend's house, and/or snow mobiles, or ATVs – a team has far more resources than the individual. Power Grid Failure – Why Does The Grid Go Down? What causes brown outs (partial power loss) and black outs (full power loss)? Snowstorms, tornadoes, hurricanes can generate damaging winds or debris that take down power lines. Cyber attacks are moving from theory to reality. A recent cyber attack in Russia took down the Ukraine power grid. The US utility grid is attacked constantly, it is likely the hackers will eventually succeed and do something bad. (Airports have also been hacked numerous times. Infrastructures breached so far no bad guys taking action … YET. In Madison Wisconsin – a police action resulted in an “Anonymous” attack against police services. The protest hack resulted in actually interfering with 911, fire, rescue and police for the entire County. Hackers attacked with the intent of going after the “bad cops” and actually caused outages of services. This was a small attack but it had significant impact. In 1989 Canada experienced a power outage related to a solar flare. Brownouts and storm related power outages are more common. Earthquakes damage infrastructure, which may take significant time to repair. In 2003, there was a “software bug” power outage, which affected an estimated 10 million people in Ontario and 45 million people in eight U.S. states . 9/11 is another example of a disaster that impacted services including regional phone services and transportation. This is a map of the aging US power grid. There are 100s of things that can cause a small local outage, a regional power outage or even an national grid power outage. The United States endures more blackouts than any other developed nation as the number of U.S. power outages lasting more than an hour have increased steadily for the past decade, according to federal databases at the Department of Energy (DOE) and the North American Electric Reliability Corp. (NERC). According to federal data, the U.S. electric grid loses power 285 percent more often than in 1984, when the data collection effort on blackouts began. 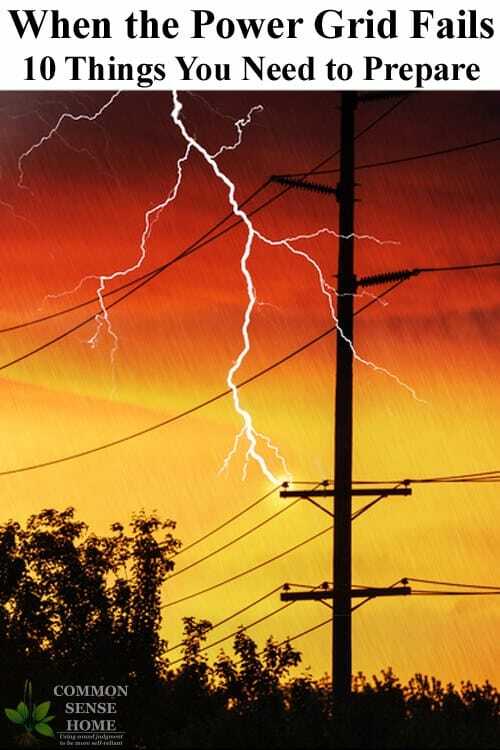 That’s costing American businesses as much as $150 billion per year, the DOE reported, with weather-related disruptions costing the most per event. 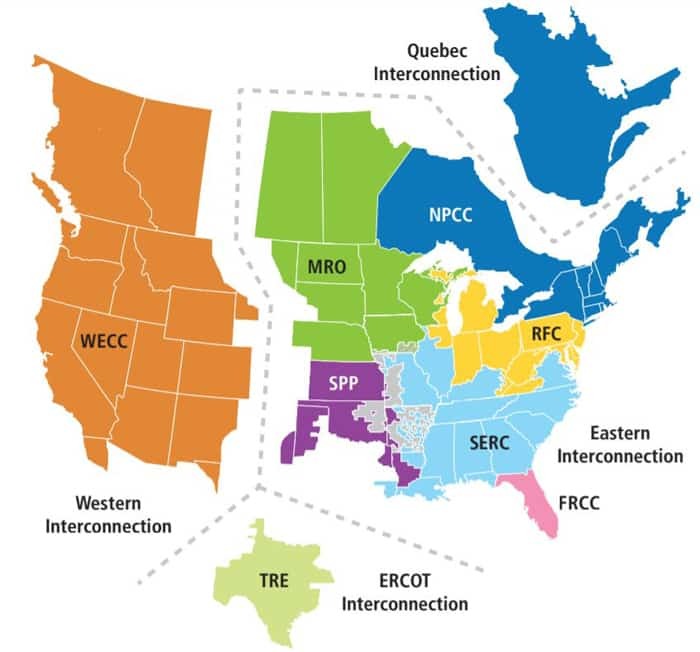 “The root causes” of the increasing number of blackouts are aging infrastructure and a lack of investment and clear policy to modernize the grid. The situation is worsened by gaps in the policies of federal and local commissioners. And now there are new risks to the grid from terrorism and climate change's extreme impacts, Amin said. Also, demand for electricity has grown 10 percent over the last decade, even though there are more energy-efficient products and buildings than ever. And as Americans rely increasingly on digital devices, summers get hotter (particularly in the southern regions of the U.S.) and seasonal demand for air conditioning grows, the problem is only getting worse. As you can see, for most of us it's not a matter of if the power will go out, it's a matter of when and for how long. We all need to prepare for a power outage. Many of the tips shared here are a good idea for general preparedness as well as power outages. We always need food, water and shelter. Has grid stability been a problem in your area? What's your biggest concern if the power grid goes down for an extended time? Where to put all this stuff? See Preparedness Storage – Finding Room and Keeping it Safe and Sound. Don't forget to check out our other Preparedness posts. Try reading “One Second After” by William R. Forstchen. It’s a fictional novel, but is an eye-opening illustration of what could potentially happen after an EMP (Electromagnetic Pulse) event. Yes, a very thought provoking book. I read it. it’s also important because he based the results on congressional and military studies done to determine the effects of a large scale EMP. No guesswork on that part by him. he does give the main characters some advantages to keep them alive, but that allows him to play out the effects of the EMP over time. Very well written fact based book. as far as the aftermath of an EMP on industry, communication, and transportation, I don’t think there is a better researched book. I’m surprised nobody attempted ot make a movie out of *One Second After* yet. That would make a good one considering all the Christian or historical films that have been coming out by indie developers recently. The topic may be to real for the studios to touch. There’s a so called “trailer” for a movie on youtube, but it’s awful. The problem with one second after is that during an EMP there will be a back EMF that makes electricity goes backwards frying all the circuitry of the vehicle even older ones because of the battery. The battery will be fried. Your flashlight probably won’t turn on again even if it’s off during the event. I’m not sure what you mean by “back EMF” but in an AC system the electricity travels backwards 25 or 30 times every second (if you’re in a 50 or 60 Hz country). Older style flashlights with incandescent bulbs are generally too small to be affected by EMPs, as their size means they can’t pick up enough electrical current to cause any damage. Newer LED flashlights won’t pick up any more stray current, but since LEDs are much more sensitive to overvoltage situations there is perhaps a small chance that these could stop working. for months at a time. Laurie’s list is excellent (most people forget about toilet flushing, start to fill your bathtub and replenish from ANY undrinkable water you come across). Have ordinary bleach on hand, a small amount added to ‘unsanitary’ gathered water and to ‘toilet brew’ is good. If you haven’t gotten 1 of the small cooking stoves (shame on you) an “alcohol stove” can be made from metal cans and plain old, off the shelf alcohol (DYI info is readily available). Last, matches can be “waterproofed” by quickly dipping their lighting end in liquefied candle wax. Don’t try to do everything at 1 time but DO keep at it. Thanks for the tips, Tom. Also hand sanitizer makes a great fire starter in an emergency. It is about 99% alcohol!! Just have to be careful using it. I rarely use it, so wouldn’t have thought of that, but it makes sense. I have to disagree. I have attempted to lite a pellet stove with hand sanitizer on multiple occasions, using a lighter (the long, gun type) and I might as well have tried to light a puddle of chocolate pudding. You bring up a good point… always try out these methods first… and then practice to stay sharp. Also, if you wear perfume, that can be used for a fire starter. And dryer lint. When I was in Girl Scouts, we used to take dryer lint to camp to use for kindling. You can get a plugnplay t-stat to convert a small chest freezer into a fridge. Chest freezers are much more efficient than front-opening units (what kind does the grocery store use ? They usually don’t even have lids). The behemoths Americans are used to use too much power for most solar systems and require too large a generator to run for an extended period. Amazon sells the stats (Johnson control–less than $60). Get the stat ahead of time, as they will be very hard to obtain during an extended outage. If you can afford one, get the freezer as well. I didn’t even realize those existed, but it makes sense. These – Inkbird Itc-308 Digital Temperature Controller Outlet Thermostat, 2-stage, 1000w, w/ Sensor – look like something similar. This all really great advice. Being in the electrical business as well as the home generator business, I would like to say that financing a generator is a great way to make it affordable. Many good companies will offer great payment plans that you can take advantage of. I would also recommend the MSP Core 4 or Core 5 backpacking stoves. They can be configured as a rocket stove, wood gassification stove, or a combination. The 5 is the bigger stove. I know the Core 4 will support a 10 inch dutch oven or skillet with no problem. These stoves are extremely efficient. it’s surprising how little ash you get compared to the amount of wood burned. I have a question I’m hoping someone can answer for me. We bought a house last year that has a gas generator attached to the house and comes on after a few minutes of the power going out. I’m curious if the generator would still work if an emp took out the electricity? Thanks for any help! It depends on the unit. It’s possible that the controls might be shielded somehow, but unlikely. Will an EMP wreck havoc with a pacemaker? Maybe. Many of the newer ones have some sort of shielding, but it would be best to check with your healthcare provider or pacemaker manufacturer to be certain about a specific model. Will an EMP destroy trains? I know steam trains will still work like on heritage railways. Could an EMP be the return of the steam era? Anything with electronics will stop working – modern trains included. This is a little bit of an exaggeration, like back in Y2K when it was said planes will fall out of the sky once the date ticked over to 2000. An EMP is dangerous only because electrical wires act like antennas and will pick up an electrical current, and in the case of an EMP, some wires will pick up more of a current than they were designed for. The amount of current they will pick up is related to their length, and whether they are shielded or not by some sort of metal enclosure. This is why power lines, which are very long and have no shielding at all, will pick up huge electrical surges and deliver them to people’s home electrical outlets, possibly damaging anything plugged in at the time. Trains may be damaged for the same reason if they are electric, but diesel locomotives will likely be unharmed since they are enclosed in giant metal boxes which will shield much of the electronics they use for control. Likewise it has been shown by experiment that modern cars are also surprisingly rugged when exposed to low-level EMP, with things like the entertainment system crashing but everything returning to normal after the car is switched off and back on again. In some cases the vehicle battery had to be disconnected for a minute or two to completely reset the electronics, but there was no lasting damage. Things like cell phones have wires in them that are far too short to pick up any meaningful charge from all but a direct hit with an EMP, so chances are most phones will keep working even if they are not shielded. They might even get a signal from the cell tower because towers typically have excellent lightning protection, which means they have a great chance of surviving an EMP. Of course if grid power goes out which is quite likely, it may only be a few days until the backup batteries in the towers go flat so this doesn’t mean it will be plain sailing. Don’t totally agree. The odds of a solar flare or a nuke bomb EMP are extremely LOW. The odds are at some point an EMP will occur. It is not “theoretical” not like Y2k. We have examples in 1859 and recently in Canada in 1989 as noted in the article. Knowing the exact amount of energy is a true unknown. However, the amount of energy in a small to medium solar flare would be absolutely massive (a large one would potentially cause flash fires). The impact would be far more than the impact seen in 1989 when we were just grazed by a small solar flare. So I don’t agree it is the same as Y2k. A solar flare could be hours to over a day (based on direct solar flare observations). So the impact of a solar flare is significantly more complicated as demonstrated by the 1989 Solar EMP. The solar flare is not like lightning at all. The nuclear bomb EMP would be more like the lightning – based on the RF signature of the previous EMP tests by the military. You are correct on the diesel locomotives and I agree some cell towers might survive. But my opinion (not fact) is that the sensitivity of the tower electronics would be damaged by the ongoing solar flare. Regardless of individual devices or engines surviving, the grid would be seriously damaged, if not outright destroyed (but again extremely unlikely, my guess millions to 1). I believe a cellphone may be damaged mainly because some use RF (near-field) charging which is designed to receive an RF charge and in a solar flare the ambient charge would be thousands if not 10s of thousands of times higher. Regardless even if cellphones don’t get damaged — the wider grid damage is the higher risk. Lack of electricity will be the issue. I encourage you to research the 1989 event to get a good idea what a nationwide or worldwide event would be like. As noted odds are extremely low – but the level of risk (ie the impact) of a direct hit from a small or moderate solar flare would be devastating. I wish it would be like Y2k but it would not be- we have tests and a real world solar flare example of 1989.
Who has elevators at home? LOL. Anyways the real scary deal will be when the liberals and feminists decide to go on *Conservative Hunting* sprees in order to purge the world of filth according to their views. That’s when the blood baths will start. Do you want to be caught in that especially if you have a family to take care of or being taken care of by a family? It will be like the Russian Revolution where one dictator gets replaced by another in a different dress with different factions all killing each other for various causes. Handicap individuals may have person elevators or stair lifts in private residences. Many people live in multi-story apartments or condos and regularly use elevator access to get to and from their homes. Yes we were thinking multi-story apartment buildings. A LOT of people live in them, and they consider them home. So yes, it sounds funny to some of us (including me – until I lived in an apartment/condo for 5 years by necessity). Even though we live near a nuclear power plant our electricity is from another source. We frequently have outages. Though they don’t last terribly long, your article came on the heels of one yesterday. Good timing. I printed it out in anticipation of not having computer access. Will look it over more thoroughly and physically check off your suggestions. Thanks Laurie! We had an outage just last weekend. It only lasted a couple hours, but it was a good reminder of how much we depend on the grid. The boys just built a replacement housing for our generator (the old one wore out), so it’s on the to do list yet this fall to get everything resettled for the winter, just in case. With the US giving up control of policing the internet recently, the hackers are only going to get bolder, and I’m concerned that basic services will be affected more regularly.
? in the event of EMP- is it correct to assume that even battery operated devices; walkie talkie;radio;etc won’t operate? Probably – unless they were somehow shielded. That’s why you see so many posts about homemade Faraday cages on prepper sites. Putting sensitive devices in a grounded container – such as all metal trash can that is grounded would likely protect them. The can functions as a shield, or Faraday cage, which absorbs and redirects the voltage to “ground”. The same reason some vehicles could potentially survive, as they would be isolated from ground – the problem is when something is PART of the electrical path – it gets smoked (literally). Make sure you research this thoroughly from reputable sources before trying it, because there are a few gotchas that don’t seem to be covered on some prepper sites. For example, if you put the lid on the trash can but don’t seal it with conductive foil tape, the tiny gap between the can and the lid can act as a waveguide (fancy type of antenna) and direct some EMP energy inside the trash can. Small holes in the sides aren’t an issue, but the long thin continuous gap where the lid meets the can is. This gap needs to be closed by something electrically conductive like foil tape. Also grounding the can is at best unnecessary and at worst more likely to damage the contents. A Faraday cage works even when it’s not grounded, and people are tempted to ground their trash cans to the electrical system – the same electrical system that will deliver huge surges during an EMP. If you are storing valuables inside your shielded trash can, why would you connect it to a giant antenna like the electrical system that will deliver a huge surge during an EMP?! You have a great list, I had not though of some of the things that you have posted on your list. Is it possible that you could make that list printer friendly? I have pain in my hands at this time of the year, which makes hard for me to write. I appreciate the work you did with that list. Orpha, I just emailed you a copy of the list so you can print it out more easily. What about money? Does it make sense to securely store some cash? Would banks operate? Could I get something out of a safety deposit box? Would cash even be used? Would using cash make us vulnerable to robbery or home invasion? Could I get money from retirement accounts, or my monthly Social Security checks, etc. etc. etc. That’s not entirely straightforward. Depending on where you live, cash may or may not be useful, or useful to varying degrees depending on the type of outage. For instance, post-hurricane this summer, my friend in South Carolina found that many stores were not accepting cash, only credit, because they could not make change. I’m sure that in other cases, some places will only accept cash. Having money onsite may indeed make you a target, so if you plan to have a stash, I’d have a concealed safe, and maintain good OPSEC. Depending on the extent of and severity of the outage, bank funds and government payments or all types might be unavailable or delayed. And not just modern US currency. You may want to keep some silver, and some small denomination gold coins (Mexican 2 peso, for example, NOT 1 oz. coins). These will hold value even if the banks fail. Go to a local coin club. Members will often have inexpensive coins to sell. Just act like it’s a hobby, not a prepping activity, and no one will bat an eye. I don’t recall seeing gasoline on your list. When the entire portion of Southern California lost power back in 2011, it was really scary. https://en.wikipedia.org/wiki/2011_Southwest_blackout I remember parking my car 1/2 mile from my house because the traffic stopped moving, we were sitting in traffic for 45 min in one spot on a neighborhood sidestreet. I remember walking past the 7/11 and saw cars crammed into the parking lot and gas lots. The pumps are electronic and did not work. Although Southern California lost power for 11 hours, it was a huge wake up call and showed us just how unprepared we were. I don’t let my car get past 1/2 a tank anymore. I fill up as often as I can. If I had a safe place to store a small gas canister I would. Great article, thank you! And I couldn’t put down that book A Second After. It was very well written. Be it cyber attack, solar storm, or in Southern California’s case, “human error”, It can happen, no doubt about it. Thanks for sharing your experience. I didn’t even think to add that to the list, as we regularly keeps several large containers of gas on hand for general use around the homestead. Grandpa Neverman also made it a family rule to keep the gas tank topped off, so we stick to that, too. Gasoline does have a “shelf life” of sorts. If you want gas to last a year or two you probably want to add a Gas Stablizer to it. What I do is rotate my stored 5 gallon cont. of gas through my car every 4 to 5 months and refill the cans with fresh gas. *I store any extra gas in my shed.. NEVER the house or attached garage. I also keep a Small BLUE storage container of kerosine for hurricane lanterns and my kerosine camping cook stove. Another good book: Farham’s Freehold – about the aftermath survival effort. It’s fiction, but good reading. I live in Florida and have been without power several times after storms and no backup power. Three times over 20 days. I made good use of my outdoor solar lights for indoor lighting. Very safe. Thank you for such great info. I was unprepared for a electrical blackout after a huge wind storm in the foothills in Los Angeles. Ten days without electricity during winter. It got dark very early…and some of us had holiday food in our refrigerators…needless to say all my neighbors lost it all. I faired well that time…had three more black outs in three years..some due to storms..lightning hitting tranformers..and tree falling down taking the electric poles and all with them. Quiet scarey. I always keep candles..extra ice filled water bottles in the freezer in case of a power outage to put in the frige to keep my food cold…sort of like the old ice boxes my greatgrandma had. All was a learning experience. Need to buy a generator that’s for sure. The new generators are more user friendly than the old ones used to be, so that makes it easier when you need to use them. Make use you have a generator enclosure, or plan to run it with the garage open (especially if your garage is attached. You don’t want those fumes building up inside an enclosed area. Generally a good summary. Would recommend Coleman propane stoves. Safe, simple, last a long time. Get Coleman L for 20lb tank and you can “camp” in your kitchen with heat, light, hot food.Have used for a week during Hurricane Fran and an ice storm one week outage. Propane stores well and safely if outside. The newer crank radios work well and come with USB ports for your cell phone. A small chest freezer and a small generator (Honda) will go a long way in saving a lot of food. Can make ice jugs when current on, keep in small freezer, put in cooler for a week to keep refrigerator food. Get soy milk, does not need refrigeration till opened. Perk coffee pot, instant coffee, ibuprofen to correct coffee withdrawal. Thank for sharing your experience. UHT milk is also shelf stable. Excellent point… always have a supply of common meds for upset stomachs, diarrhea, constipation, Tylenol, aspirin, cough meds, lozenges, and vitimens. When emergencies strike its those little things that can mean a lot. Remember ..you can use a butane stove inside, but not propane…a deadly gas. Great Tips… I always forget about #6 and should really be working on a portable toilet for our family. I didn’t see a word in either the article or comments about keeping some means to defend those stocks of what you have. Your burglar alarm isn’t going to work in a power outage, and police/fire are going to be busy in this situation. If you are comfortable with firearms, by all means keep them and TRAIN YOURSELF AND YOUR CHILDREN in their use and safety. DRILL it into your children that any firearm they see is presumed to be loaded unless proved otherwise. If you are not comfortable with firearms, don’t keep them and risk hurting yourself or a family member. You would want pepper spray, an air horn, wasp and hornet spray, something that you can use at a bit of a distance. You want to avoid hand to hand combat if possible. If they have a gun, and you don’t, you’re better off letting them have what they want, and getting out of there as fast as you can. This part of the topic could be another entire post, but thanks for your feedback. All good points. Agreed. There are a number of sites on you tube (some by local Sheriff’s departments) which discuss “Hardening” or Securing one’s home to make it less appealing to burglers. NEVER a bad idea. AKEA, your comments about personal security in a disaster is an issue that is not addressed by enough people. It falls under the category of someone else doing for you. This entire post is about being self-prepared which is almost the most important issue a family can have these days. The ideas expressed are ones we all should examine – yours included. Thanks for bringing up security. I’ve lived in a low population rural county since 1983. One thing I’ve learned is that power outages are going to happen. The usual cause is either a lightning strike on a transformer or a freak ice storm taking down power lines. One of my former residences was prone to having the transformer struck by lightning because the house was built on top of a large outcrop of granite. Our transformer was fried 3-4 times per year, every year. That was an awful inconvenience, so we were always prepared for it. My recommendations are to take extra care with sanitation issues. (bag in the bowl or 2 bucket system, hand wash station, etc.) Also, if you live out in the boonies, I recommend that you have an LP furnace or space heaters & an LP cook stove. You can heat your home during an outage in the winter & cook and/or boil water all year round. When you live in the country, unless there are burn bans, you can burn your trash. I store extra dried beans, rice & pasta at all times, along with some canned meats & sauces. That, coupled with whatever is in your freezer will get you through an extended outage. Like you, I keep a few extra 5 gallon cans of gas for lawn mowers, etc. There is a good reason to keep your vehicles tanks topped off… It’s to prevent the accumulation of water in your fuel tank due to condensation, which is pretty common in the cooler months. Get a 20 pound LP tank & several 1 pound LP tanks & you’re good to go for cooking if you don’t have a gas cook stove. There’s a brass coupling you can buy that will allow you to refill 1 pound LP tanks from a 20 pound LP tank. (and probably let you refill a 20 lb. tank from a 250 lb. tank) I’m an avid camper so my camping gear is just about the same as prepper’s gear. I have many alternative methods for cooking meals, lighting, charging small electronics, etc. My home is the bug out location for my extended family, so I’ll be hunkering down. Unless a tornado hits here, I’ll never bug out. I have maps, lots of maps… I have a large spiral bound Rand McNally US map, several state maps & many county maps for all the contiguous counties surrounding my county. County maps are good for finding alternative routes such as county roads & private roads. I enjoy reading your website because you post some very practical articles. Thanks & keep up the good work. Thanks for your kind words, and thanks for sharing your experience, J. L. All good advice. We have a stash of paper map, too, and made sure our sons know how to use them. with GPS tech so common now, many of the younger generation are unfamiliar with map reading. When I lived in PA, in our neighborhood, we lost power at least once a year from car vs. pole. Pole always wins. Somebody else, on another site, discussed dried vs. canned beans. Dried beans are lighter and more portable, but having to soak them and cook them uses up precious water and fuel. Beans in cans require a can opener (have a manual one in your emergency supplies), but can be eaten right out of the can. With beans in jars, you have the risk of glass breakage, but again, ready to eat. And if you should break a jar, save the broken glass to use as a cutting tool or weapon. Probably the best thing would be to have a mix of dried and canned, to cover all your bases. I was thinking about the possibility of an EMP attack the other night and was realizing that if it were done it would most likely be carried out during the night, since our various enemies know that if people woke up, they would be, for the most part, unable to do anything until daylight. Even if you keep flashlights next to your bed, if they have LED lights, they would be disabled by the EMP. Also, our enemies know, I am sure, that most of our military members who are married live either off base or on base housing and would have no way to get to their duty stations. I was thinking that one way for individuals to deal with that, to some extent, would be to keep a flashlight in one of those Faraday bags next to your bed, probably one in the bathroom, so that you might be able to get to your larger Faraday cage(s) to get and use other electronics or items you have put away for such an event? What is your thought on that? With the current threats from N Korea it is something we need to think about and plan for in advance. I also have some low power power-stations which have to be recharged every three months even if you don’t use them, so I keep them in one 31 gallon metal garbage can, sealed with aluminum tape, and then take them out every 3 months on the first of the month, to recharge them. Also have small solar panels with wires to use if necessary that I keep in the Faraday cages at all times. Those can be used to recharge items and batteries to keep other things going. Yes the scope of an larger EMP is overwhelming. Even with small or even moderate generating capacity, it would be a rough life. The ONLY food would be local as 99% of vehicles would not operate, and things we take for granted would be gone for weeks, months or even years (depending on the number of nukes). It is a hard concept to deal with – and the odds are quite low. So we recommend the 72 hour, or 3day storm preparation as a starting point. Having enough for a couple of weeks is the next recommended level, ie Catrina/Harvey level storms – and in the north a week long snow storm causing power outages. These are more likely and more straightforward to prepare for. With all that said, we are not discouraging prepping for a small or even large EMP… its just hard to prep for. I was thinking about something else that should be in your bug-out gear: cigarettes, EVEN IF YOU DON’T SMOKE. Someone who is Jonesing will do or give you anything for a smoke. They can be more valuable than cash. And toilet paper! Lots of it. Don’t forget toothpaste and brushes! Think when there is no sewer and people go months without a proper bathroom and you come along offering fresh toilet paper that you can wipe properly and toothpaste with brushes! People will be so thankful to have basic hygiene tools again. You’re welcome. Even small steps add up over time. You may also find the article “Fight Rising Food Prices – 6 Proven Strategies to Stretch Your Food Budget” helpful, too. When my children were small, we had an indoor smores making kit. It gave me the idea of using sterno cans for cooking during emergencies and extended power outages, The sterno produced heat sufficient to heat canned soup, canned pasta, heat water for coffee, tea or hot chocolate. Sterno was also a safe, indoor, heating option. Cases of 12 sterno cans may be easily purchased at party stores and some big box stores. In addition to propane for my Coleman stove, I keep sterno on hands. One last suggestion, keep a bottle of unscented bleach in the emergency supplies. The list of uses is extensive. But most importantly, to pretreat questionable water for drinking. There are ratios for bleach to water posted on the internet as well as instructions for the time necessary to wait before drinking the water. I keep a 3 ring binder with info specific for emergencies. Can’t always reference the internet during an emergency. Thanks for the useful information. Thanks for sharing your experience, Karen. There’s more information on water safety in the post “Emergency Water Storage and Filtration – What You Need to Know Before Emergencies Hit“. Karen makes an excellent point. You won’t be able to access Google etc. to get instructions, menues, etc. I have a number of folders with info. recipes I might need. That was very smart to PRACTICE cooking with sterno and your Coleman stove. It doesn’t do any good to have them if you don’t know how to use them. Good article – but one important thing that was not mentioned is that you need to have cash on hand! All ATMs will be down – banks will not be able to help you get cash. So you should have cash on hand. Preferably and smaller bills. Interestingly enough, when my friend, Amber, dealt with power outages and road closures after flooding, some stores that were able to open were accepting credit but not not cash – because they couldn’t get reliable cash pickup. Thanks for the note and we’ll add that to the article. Most of the web (and our nation) is ran by feelers those who are extroverts and feel thru life and don’t know diddly squat about anything or anyone unless it’s their niche interest. They are taught by evolution there is no truth only what is deemed comfortable in their safety zone. As a result do you really think we have anyone knowledgeable to operate our grid when the retirees finally die off? The grid is operated mainly by elderly whom should’ve retired 10 years ago but are keeping things going. There is a high opening rate for linemen and grid operators. Nobody wants to work. I think things have been a little too comfortable for too many people for too long. No motivation to tackle hard work. Also, many corporations treat employees as disposable and interchangeable. Why work your heart out when your employer could care less? On the flip side, businesses deal with ever increasing regulation and job hoppers. Why invest in a person when they’be be gone at the next opportunity that comes up? It’s all a hot mess. Why work? You can get paid to be homeless. You guys should read the Alex Scarrow books. Last light is based on what happens when the oil stops pumping to the uk. It isn’t so much survival advice but a story of one families survival. It was very thought provoking and it gives you a taste of the things to think about. Personal security will be a paramount concern in about a week after a grid failure. Even people who are pacifists will change their M.O. when their family has no food or means to acquire food. Even if you are now against guns, wake up, they are a tool to protect yourself when civility breaks down. If you know someone who shoots or hunts, ask them to take you to a range and learn how to safely and responsibly handle a firearm. Buy a reliable rifle or handgun and know how to use it, store it and how it functions. When society breaks down and people are eating your neighbors dog, the life you save may be your own.